Jim Steele, the manager of Fort Fisher State Historic Site was our May speaker. 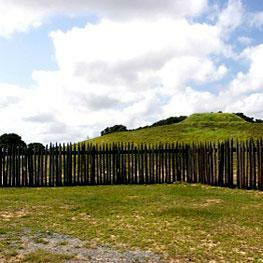 He talked about the history of the site noting that the site was the first designated National Historic Landmark. It’s significance was as the protector of the Port of Wilmington. After 1864 it was the only southern port open to bring supplies in to Robert E. Lee’s army. Beach erosion has destroyed most of the sea face of the original fort which extended for more than a mile along the ocean. In 1996 the Corps of Engineers installed 3000 feet of revetment to stop this erosion. Over a half million visitors come to the Fort each year, and guided tours are offered on the hour every day the fort is open to the public. The Fort Fisher Strategic Planning Committee was formed two years ago to create ideas for the future of the site. Current plans include replacement of the 50 year old palisade fence which has deteriorated greatly. A model of the fabled Armstrong gun is being fabricated to be displayed at the visitor’s center and more interpretive signs will be placed along the trail around the mounds. New sidewalk and interpretive signs are also planned for Battle Acre which has long been ignored. A lively discussion followed Mr. Steele’s presentation. This month we recorded 55 members and guests at our April meeting and exhibit opening. We had 86 visitors to the History Center, a nice increase over last year’s 54 visitors. The gift shop took in $ 167.89 which is a heartening increase from the 35.17 we took in last May. The Pleasure Island Sea Turtle Project held its spring orientation at the History Center. Both Got-Em-on Live and the UDC held their monthly meeting at the History Center as well. Thanks to our History Center Volunteers; Lois Taylor, for helping get the newsletter into the mail, and to Cheri McNeill for her always thorough proofing of the newsletter. Thanks also to Demetria Sapienza for her work on the History Center’s photographic collection as well as all the work she does as Society Treasurer. Thanks to Elaine Henson and Darlene and Leslie Bright who spent long hours ensuring that Devin’s exhibit was as factually accurate as it could be. Thanks to Doris Bame for helping out with the logistical details of the annual essay contest conducted with the 4th graders of Carolina Beach school. Treasurer’s Report: Money is coming in steadily for the cruise. It will be a relief to have the money from this biennial fundraiser in the bank as we work on next year’s budget. We still haven’t heard anything from either Town about funds for the 2012-2013 budgets. So keep letting our elected officials know how our History Center helps the whole community. 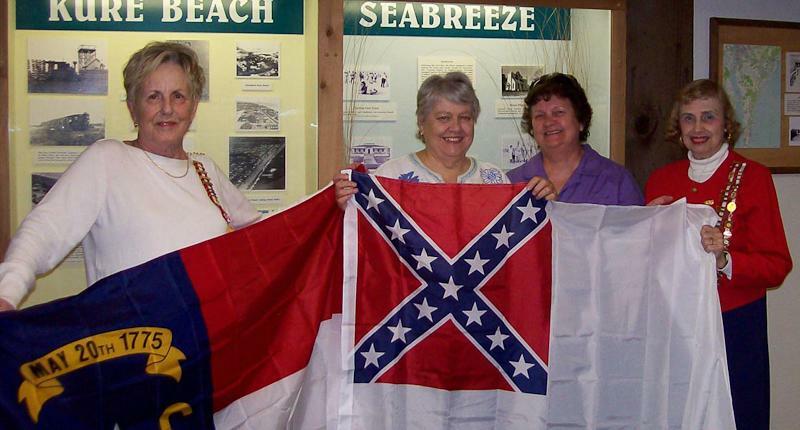 Thanks to the Fort Fisher Chapter #2325 of the United Daughters of the Confederacy for presenting the North Carolina Flag and the Second National Confederate Flag to the Federal Point Historic Preservation Society’s History Center at the March 19th Membership Meeting. The Chapter holds it’s monthly meetings at the History Center and appreciates the society’s contributions to our area’s history. Politics: – could be pretty hot and heavy sometimes, but all seemed to be friends after the politics were over. Some longtime residents thought it was a bad idea to allow the construction of big houses. They thought it would destroy the character of the beach. Brenda’s father was definitely in favor of the 35 feet height limit to prevent another Myrtle Beach. Brenda and her father disagreed oven the height restriction but she is now glad buildings are not higher so you can still see the ocean. This whole area was a maritime forest that held the land in place during storms, a beautiful wooded area. The Federal Point Historic Preservation Society held its monthly meeting on Monday, May 21 at 7:30 pm at the Federal Point History Center, 1121-A North Lake Park Blvd., adjacent to Carolina Beach Town Hall. 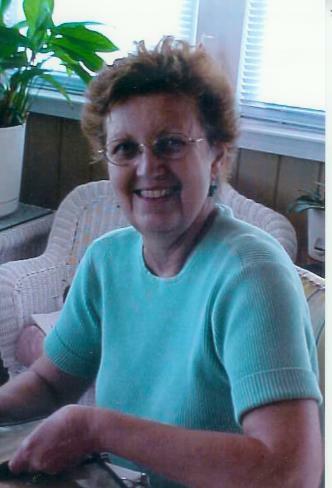 Lois Carol Wheatley grew up in a rural area of Maryland that is now the bustling metropolis of Columbia. She likes to claim she’s pre-Columbian. With an undergraduate degree in English from the University of Maryland, she went on to earn a graduate degree from East Carolina University. Her master’s thesis, “Women Writers of Black Mountain College,” appeared in the North Carolina Literary Review and is now among the permanent collection of the Black Mountain Museum + Gallery in Asheville. After grad school she went to work as a staff writer for the Herald-Sun in Durham, and for the past ten years has worked as a freelance writer for newspapers, magazines and web sites. 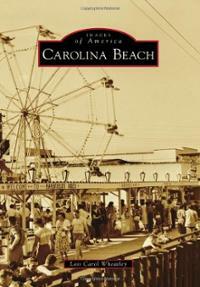 For her book, “Images of America: Carolina Beach” she collected photos of Seabreeze, Carolina Beach, Kure Beach and Fort Fisher from area residents and from FPHPS members, and then put together a slide show for our May 21 meeting. Also this month we will present our annual 4th Grade essay contest winners. 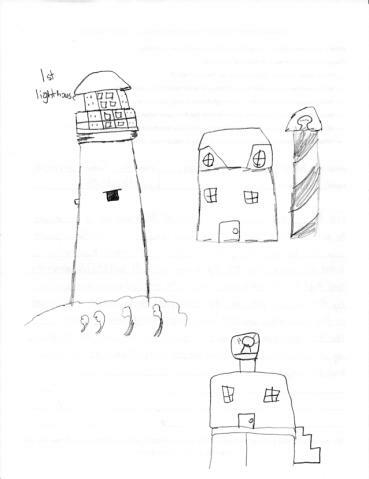 This year we have two winners, Harley Meiks for his creative essay on what it would be like to live in a lighthouse and Nicole Creech for her factual essay on the history of the Federal Point Lighthouse. Their families have been invited to join us to hear the winners read their essays and receive their awards.